What would you do, right this very second, if a disaster struck? Let’s say it’s something that took the power out for a few days. Would you be able to keep your family safe and comfortable? If not, do you recognize the importance of increasing your preparations until you can meet a crisis head on? Many people like to turn up their noses at those “crazy preppers ” but if they were to stop and really think about it, they’d realize that being prepared for those events that occur without warning is just good old-fashioned common sense. Here’s the thing many people don’t understand about preppers: most of us just want to take care of our families, regardless of the situation. We have undertaken a journey to self-reliance so that we don’t need to depend on others, like FEMA or the Red Cross, to rescue us should an emergency occur. None of these events is outrageous, right? In fact, we’ve seen all of them happen, right here in our country, over the past decade. These disasters are an undeniable part of life , and the only thing you can change is the way you react to them. A prepper is merely a person that realizes being able to meet his or her own needs is the key to true freedom and peace of mind. Preppers know that the government may not be there to save them, and they intend to save themselves. So, if you’ve gotten this far and can agree that being prepared for life’s little surprises is important, congratulations! You have taken the first step towards preparedness, and that’s also the most vital one: recognizing that there are things you can do to see your family through disasters large and small. This is a 2 part series for folks who are just getting started on their journey to preparedness. The series will give you the basic fundamentals of how to get started with prepping, help you gain an understanding of why you need to have certain disaster supplies in place, and provide some suggestions for where to get those supplies. If you want even more in-depth information on preparedness, click here . Whether you’re preparing for a short-term disaster  or a long term disaster, you have the same basic goal. That goal is: to be self-sufficient and have the ability to care for yourself and your family independently during an unforeseen event. Disasters can strike quickly and without warning. What that disaster is, depends on where you live. Knowing what type of disasters could affect the area you live in will help you plan more thoroughly for an event. Deciding on the type of disaster to prepare for will also help to determine the type of survival gear that is needed. If you are new to prepping, you should start by planning for the disaster that is most likely to occur in your area. For example, if you live in the Eastern coastal regions, you might begin preparing for a hurricane . If you live on the West Coast, an earthquake  is a more likely crisis in your area. If you live in the northern states, it might be a blizzard that takes out the power and keeps you snowed in for a week. What weather-related issues are the most common for your location? Is there a reason you might need to make an emergency evacuation , such as a plant nearby that could have a likelihood of chemical spills? Is your area prone to wildfires? You get the idea – geographically speaking, there’s nearly always one risk factor that is more likely than the others. Once you’ve identified your most likely event, then it’s time to begin acquiring items for your basic needs should that event occur. Start with a two week supply of food (here’s a handy list of what you should include ) and a two week supply of water  (the rule of thumb here is a gallon per person per day – and don’t forget your furry friends!) and begin building upon that. Typically, the best way to prepare for a disaster is to plan for the worst case scenario so that all areas are covered. Plan as though you won’t have electricity, running water, or the ability to run to the store. This may sound a bit excessive when you’re just starting out, but being completely prepared and self-sufficient for a given disaster is the basis of prepping. Soon, thinking of the possibilities and how to solve the issues that arise will be second nature for you. We all prepare for something whether it be for a bad storm, a sudden financial catastrophe like unemployment, or for a long-term disaster. Because of the many different occurences that can affect us, there are different types of preppers to go along with those different scenarios. 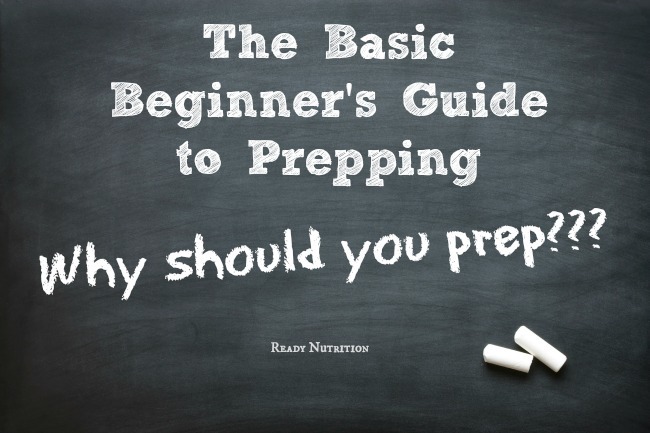 Short-term preppers are those that want to be prepared for anywhere between 1 week-3 months. Many government websites such as The American Red Cross and FEMA suggest every family have a short term food supply in the case that food routes are interrupted due to severe storms or another unforeseen event. This will cover you through most situations: a terrible storm, a local natural disaster, an unexpected financial expense. Long-term preppers are planning for disasters that could last for a more extended period of time. They plan for periods of self-sufficiency in the event that something more dramatic occurs. A few examples of a long-term scenario would be a power outage that lasts more than a month, (some people affected by Superstorm Sandy  had no power for many months after the event), a job loss that leaves you with little to no income, or dramatic events like war, an EMP strike, or a solar flare. These preppers have a short-term supply to complement their long-term supply. A longer term food supply usually includes dehydrated foods , MRE’s , seeds , hand crank wheat grinders, and equipment to be used in a non-technological environment. For a more detailed list of short term food supplies and longer term food supplies, click here . While food and water are very important, there’s a little more to it than that. FEMA, in conjunction with the Red Cross, offers a disaster checklist  to help you know what items you should have ready in the event of an emergency. The list provides a step-by-step disaster plan. It covers power outages, the potential need to evacuate your home, and situations like fires or earthquakes. This in depth list also offers suggestions for reconnecting with family members should you get during a disaster, and recommends supplies to prep your vehicle, should you be on the road when a crisis occurs. As an added way to get your home organized for disasters, I recommend every home having a preparedness manual  filled with information you can turn to at a moment’s notice. Information in this manual should be emergency contacts, preparedness supply lists, emergency plans for specific disasters, pertinent documents. Some families go the extra route and put their important documents on a flash drive . Having the information in one place helps you to think through these scenarios and keeps you clear headed knowing you already have a plan that works for your family. Disasters do not just happen to other people – they can happen to you. When you are prepared for a particular scenario, then you already have tools in place for when you need them the most. This isn’t crazy or some silly new trend. Preparing for a disaster and being self-sufficient has been a way of life for centuries. It is simply families trying to make the hard times easier. If you can see the wisdom in this, check out The Prepper’s Blueprint . This guide offers orderly, rational, step-by-step instructions to take you from a complete beginner to a self-reliant person who is prepared for whatever life hands them.